The Banks Peninsula Biodiversity Workshop held at Akaroa on October 8th was a chance for local landowners to learn about the special biodiversity found on their Peninsula properties and what they can do to enhance the habitats for local native species. It was a long and successful day which was attended by over 170 people. Lincoln University and the Banks Peninsula Conservation Trust chose a range of experts to give quality talks on local native fish, invertebrates, birds, lizards, plants and integrating farming with conservation. All of the talks, questions and answers, workshop sessions are being compiled to create a proceedings of the event so that people who attended, and those who couldn’t make it, can read more on the subject. If you did not attend the workshop and would like an electronic copy of the proceedings, contact Mike Bowie. 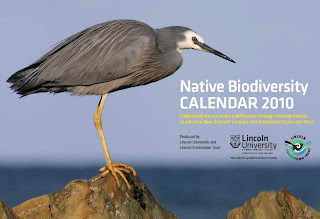 The Lincoln University/Lincoln Envirotown biodiversity calendar was also launched at the workshop. The calendar suggests ways in which landowners can create or enhance habitats for native species and of course has a lot of spectacular pictures. The calendar is available for only $10. Contact Mike if you would like to buy a copy.